Fits Full-Size Trucks (Long Bed 8 Ft.) Compatibility: Ford F 100 (2003 or earlier), Ford F 250 and F350, Chevy Silverado, GMC Sierra, Dodge Ram, Toyota Tundra, Nissan Titan. Note: if you do not see your truck model listed here, please contact us before ordering so we can confirm compatibility with your truck. 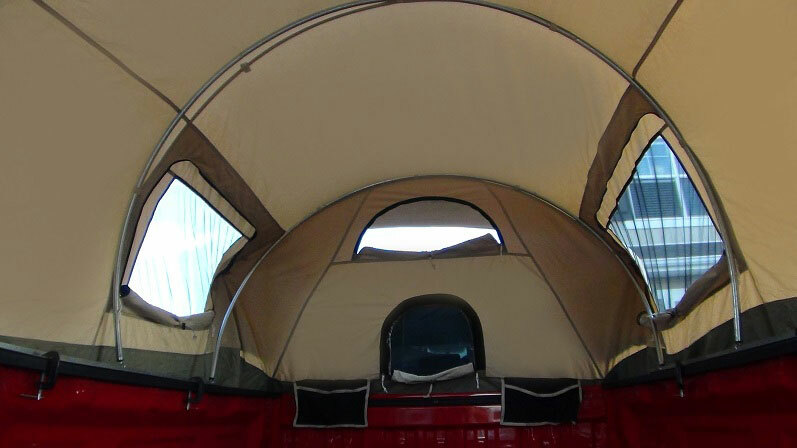 Keep yourself off the ground and away from critters by purchasing the Kodiak Canvas Tent Model 7218. 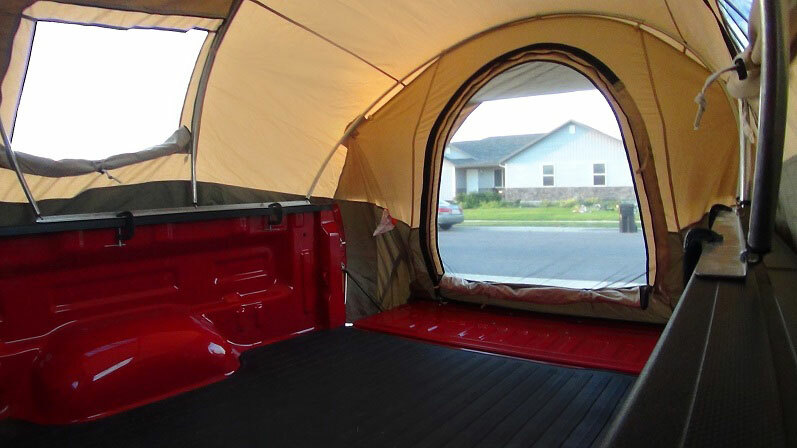 Now you can camp anywhere your truck will take you. 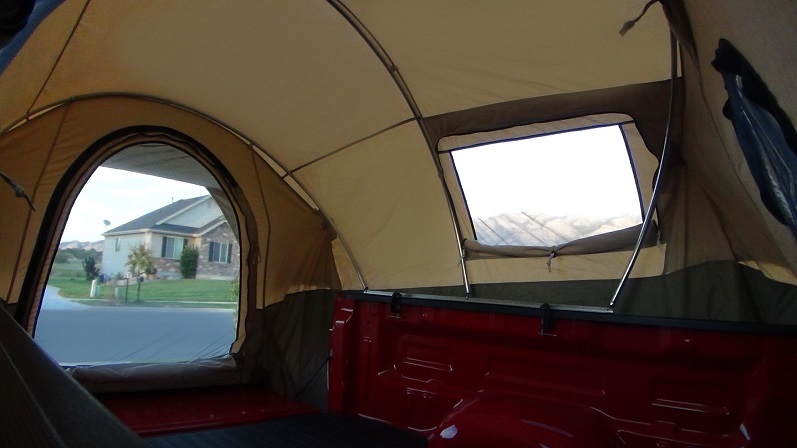 Get the renowned quality of a Kodiak Canvas tent for your pick up truck. 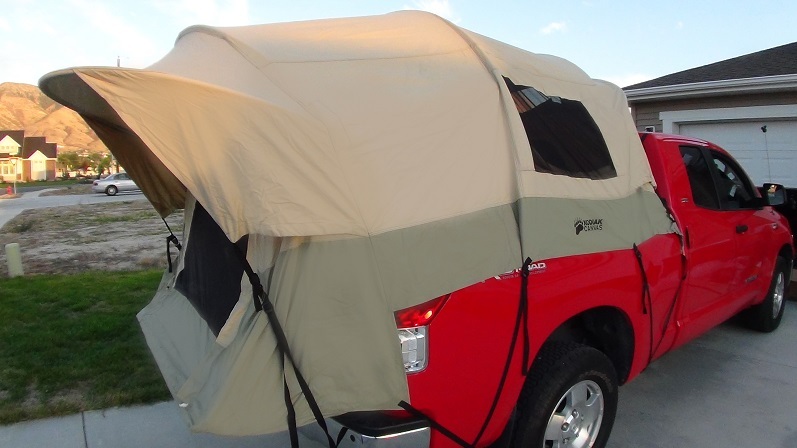 Pitch your tent anywhere your truck goes. Keep off the ground, high and dry, and away from the critters. Made with Hydra-Shied 100% cotton duck 8.5 oz canvas that is durable, watertight, and breathable. Our unique clamp-on rail design with integrated 3/4 inch steel tube frame provides unmatched sturdiness and allows for easy set up. Rated for all-season use. Features five windows with no-see-um mesh, for ventilation, light, and openness. Has a cab access window. You can run a power cord from your cab to power your appliances. Features top-of-the line YKK® zippers. Roomy 5 Ft. interior ceiling height. Sets up with tailgate down for added space. Convenient gear pockets. Carry bag included. 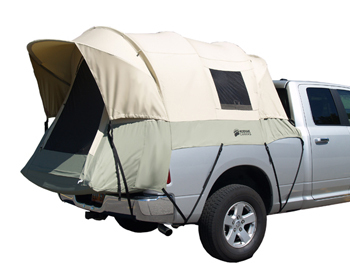 Competitive Edge Products, Inc. is an authorized distributor of Kodiak Canvas Truck, Canvas, Cabin Tents. Rugged 8.5 oz. 100% cotton duck canvas construction. Sturdy inch steel tube frame. Tunnel shaped design maximizes interior space. Tall 5 Ft. ceiling height. Tailgate down design expands useable space. 5 windows provide excellent ventilation and openness. Cab access window. Clamp-on rails easily mount on truck bed for secure fit. Large D-shaped door with top rated YKK zippers. Covered entry. Two convenient gear pockets. Carry Bag included. I really appreciate your great service. First off, this tent looks great. Kodiak makes a beautiful product. Cool. Second, this tent lives up to its promise of keeping cool. I camped in this is 95*+ with very little/no wind and, with all windows open, it stayed as cool as it was outside (out of direct sunlight). Cool-squared. Setup was pretty easy, fitting on my '94 Chevy 3500 8' bed w/dualies. My only potentially negative comments at this time are A) the front bed corners are not reinforced well like the tailgate corners are and B) the gasket on the metal rails (that sit on the truck bed walls) is not holding shape. Not sure if the latter is due to heat (possible but unfortunate), pressure (unlikely since worst areas are not at clamps), or quality of material used. 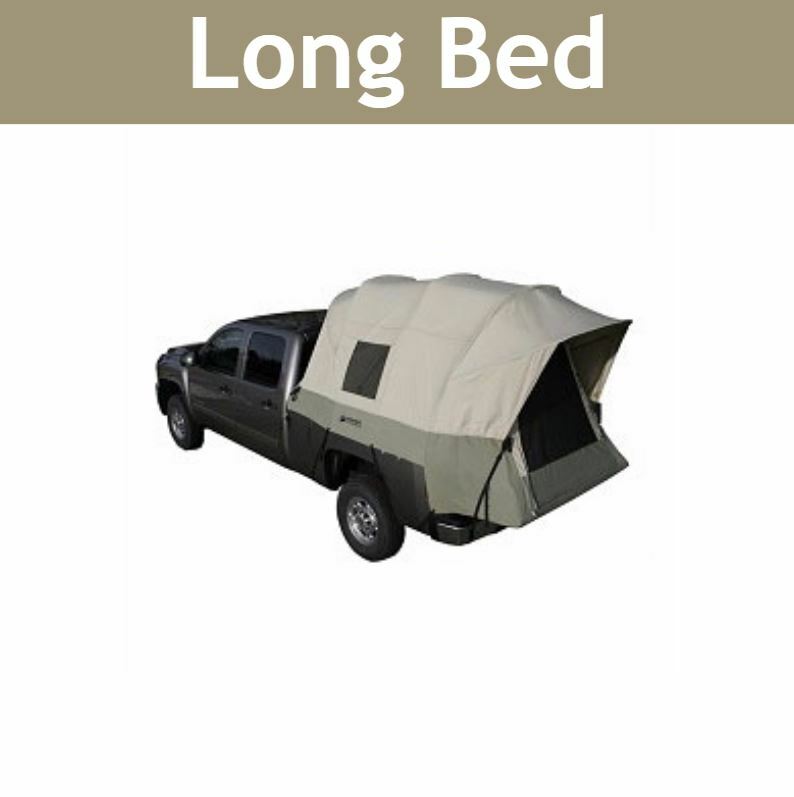 Definitely recommend this tent if you are looking for a truck tent. First time set up in yard took about 45 minutes, taking it down only 20. Only had a one night camp out and it was great. Q: How do your tents store? Can you drive with it up? A: Unfortunately, you cannot drive more than about 10 mph with it up. 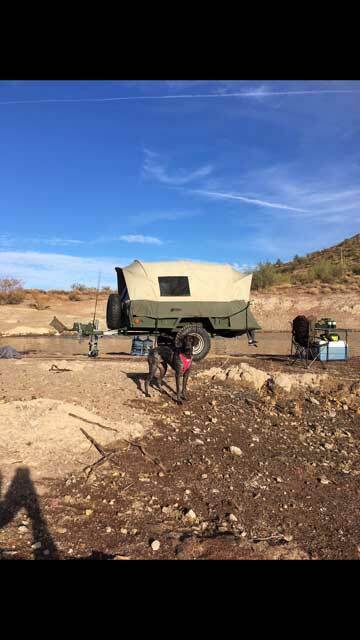 Q: I have a military trailer that is 7x7 will this tent work for that? Or is that trailer too wide? Q: How should I return order p44987? A: Please contact our customer service department at 866-308-5484. Q: If ordered today would it not ship until 09/25/2018? A: That's correct. There's a change it may come in sooner, but not more than 1 week best case scenario. Feel free to contact us with any other questions. 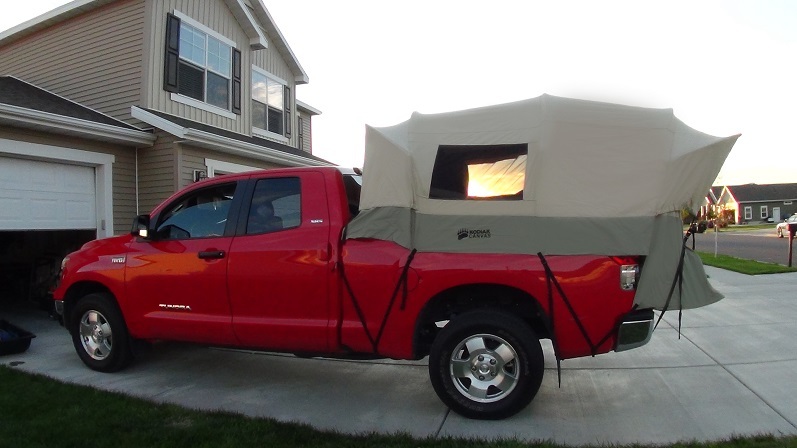 Q: Do you have a Kodiak truck tent that fits a regular bed Toyota Tacoma? Q: Does it prevent rain from getting in,an is their another tent that can connect to the back of it? A: Yes this tent keeps rain out, but we don't have a tent that can connect to the back of it. Q: I have a 1999 Chevy 3500 will it fit? 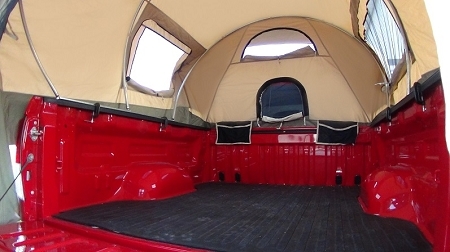 Q: Does the Kodiak Canvas tent fit a 2016 dodge ram truck with a 5' 5" box? A: Both of our truck tents will work on a Dodge Ram; however, neither will work with a storage box. A: It will Fit a Chevy Silverado. Q: I have a 2015 f150 with a 6'6" bed Would I be able to use the 7218 for my truck? A: I believe you would need model 7206. Q: How long till can I receive this item? A: These items usually leave here the next business day. Shipping to your location can take about a week to arrive. Often it arrives sooner, but we cannot guarantee any specific delivery dates. Tracking will be automatically emailed to you as soon as it ships out. Feel free to contact us with any questions. Q: I have a Isuzu double cabin pick up, does this product fit in this kind of pick ups? These pick ups are smaller than the pick up shown here! A: I am not sure if it it will fit this type of truck, you could call 1-866-308-5484 and use extension 30 to ask. Q: I have a 2004 Nissan Frontier with a bed liner its considered a long bed. Will the tent fit? I love your product idea. I hope it will fit. A: We have great News! 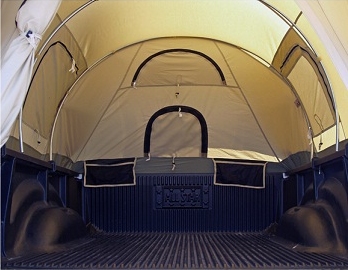 We just released the 7211 Mid sized truck tent that fits the Ford Ranger. Q: Will it still work if you have a tool box ? A: It could possibly work if the toolbox does not block the rails, does not stick out the sides, and does not go up higher than 3-4 inches. Q: Will it fit a 2015 Ford F-350 with an 8' bed? A: Yes, it does fit the 7218 ford F-350 with an 8 bed. Q: How long are the tie-down straps? A: They are adjustable to about 3 1/2 feet. Q: I have a box on the back of the truck do I need to take that off? A: Yes, you would need to take the box on the back of the truck off for the tent to work properly. Q: Why should I buy yours if I can find somewhere cheaper? A: We price match, we have expert customer service, and at the time of this question we also included a free cargo net. This product has 30-day returns: Simply hang on to the original packaging and contact us within 30 days of receipt if you are not satisfied with this product. We are that confident you will love this product! If something is damaged or defective we will get it replaced at no cost. 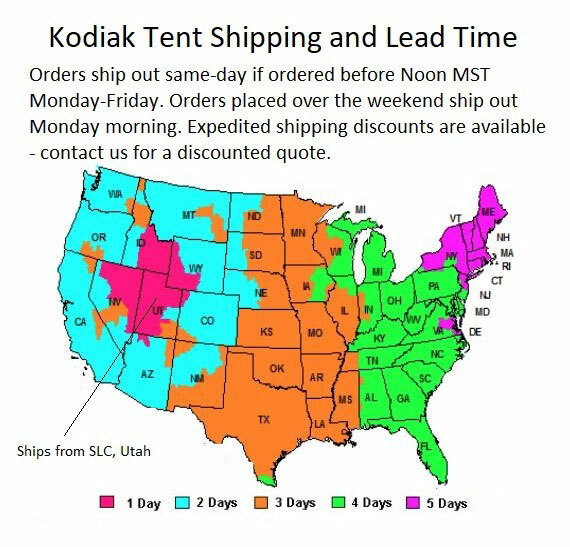 Our Kodiak tents have an extremely low return rate as customer's love these tents. The reviews speak for themselves. Please contact us before purchasing if you are unsure whether this product is right for you by calling us or via email. Please note that we are happy to waive any restocking fee if the item is unused and in the original packaging. Dimensions: 47" x 10" x 10"